Twenty-six days = 26 Strong Earthquakes for April 2014 – and it’s Not Over Yet! | Chaos Sweeps Away the World We Know! The Disaster, current events & Catastrophe Blog. Forecasts for 2014 to 2022. Read tomorrows news today! Plus current economic, commodities, stock indices and financial news. ← Disaster Projection for 2014 from the Chaos Blog. April 26, 2014 – Twenty-six days = 26 Strong Earthquakes: Today’s 6.5 magnitude quake near Tonga (see map) marks the 26th earthquake of April 2014 – and it’s not over yet. Note: The USGS down graded this quake to 6.2 from 6.5. The Tonga quake hit at 6:02:16 GMT on April 26 at -20.717S and -174.674W, at a depth of 10 kilometers (6 miles). 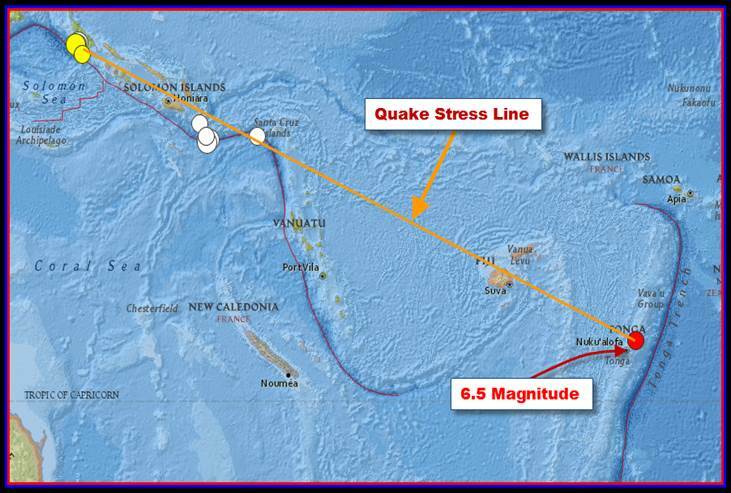 The Stress Line bounces from the Solomon Sea to Tonga; which includes the Solomon Islands, the Santa Cruz Islands, Vanuatu, Fiji and Tonga. As I identified in an earlier post today, there are many opportunities during the rest of 2014 for a significant (9.3+), Volcanic Eruption (VEI=5), or continued fires, rapidity fluctuating weather, avalanches, ferry sinking’s, etc. This entry was posted in Earthquake, The Kingdom of Tonga and tagged Tonga 6.5 magnitude earthquake April 26 2014 - Tonga. Bookmark the permalink.